In a food processor, pulse oats until broken into a coarse flour. Add in flour, baking powder, baking soda, and sea salt. Pulse until combined then pulse in butter until butter is in small pea-size pieces. Stir in Cacao nibs. Pat dough into a log or circle that is roughly 1/2″ thick. Cut into 6 squares or triangles. 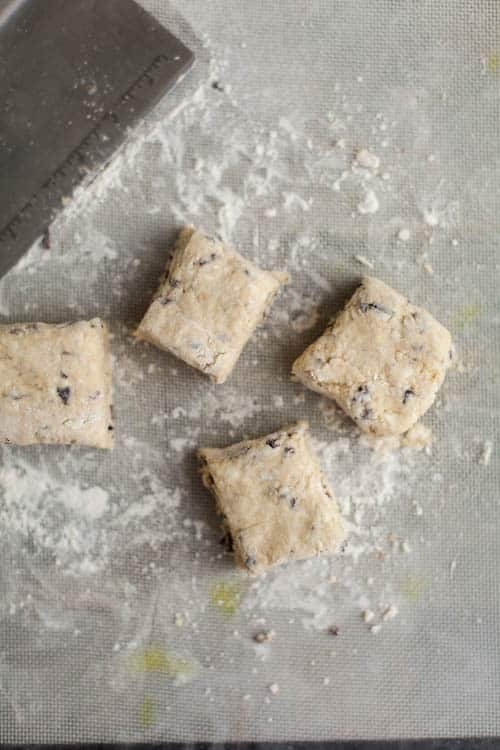 Place scones on a baking tray covered with parchment paper. Brush with heavy cream. 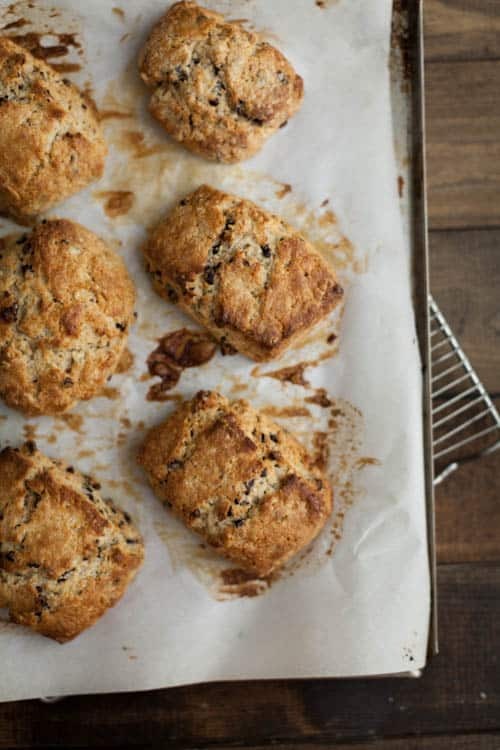 Bake scones until firm and golden, 16-20 minutes. *Chocolate chunks can be substituted for cacao nibs. 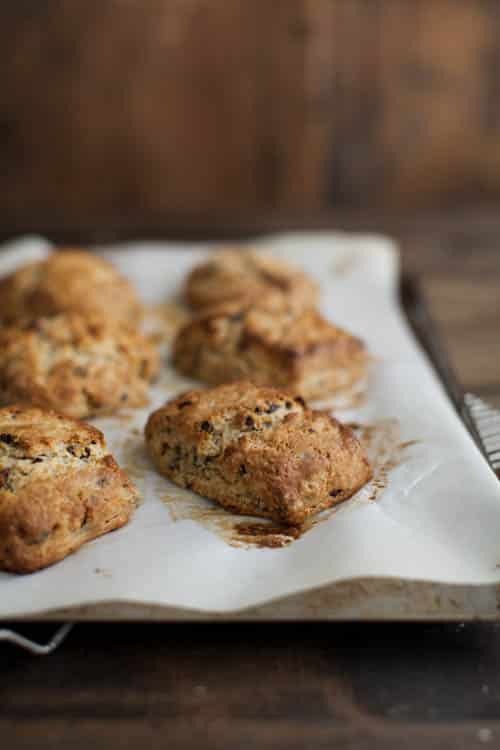 Beautiful scones, love all those cacao nibs baked in. Have a great holiday! These look lovely! They’re sure to make a morning brighter! I’ve never really done much with cacao nibs but no better time than the present to start! What a nice morning treat! Looks like another winning recipe, thanks so much for all you give us. I enjoy reading your blog and most of all, using your recipes. Have a wonderful Christmas. As always, this looks amazing! I absolutely love your blog, I’ve followed you for the past year and you along with a few others inspired me so much that I recently started my own blog. I’m definitely a rookie, but having a good time with it. Thank you for sharing your beautiful, rustic pictures and delicious recipes!! I bought a bag of cacao nibs recently for an unusual kombucha recipe. I find myself constantly digging into the bag for snacks. I’m hooked and have totally come to realize how much I actually I love the taste of chocolate as (opposed to just the sugar, as I might have previously suspected). 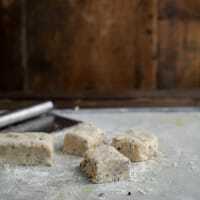 I’ve been trying to come up with some new recipes for my addiction and these sound perfect! 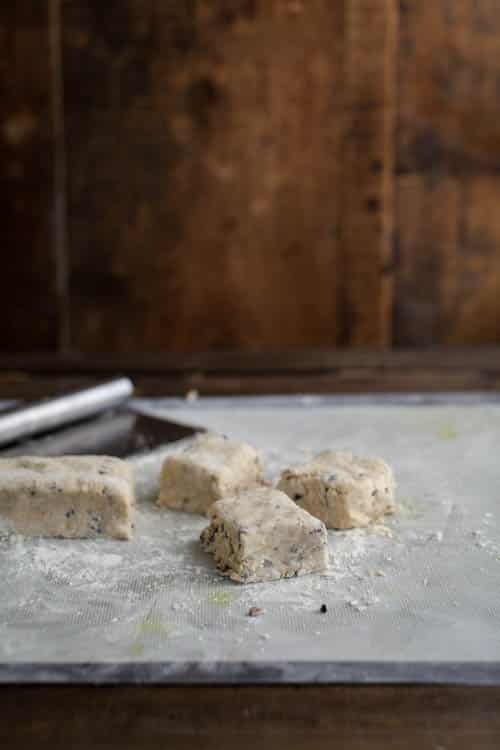 I always like to see comments from readers who have actually made the recipe. I made these the other day and loved them! I used a dark chocolate bar 70% cocoa instead of the nibs. The honey flavor came through nicely and I didn’t miss the extra sugar. Will make again really soon!! I am enjoying these as I write this comment. Very good! Hi. I made these scones for the first time and I have to say it’s awesome how little sugar is needed in them. They are still sweet but not overly so. The only issue I has was I used a food blender instead of a food processor which I do not have. It did not work in breaking down the butter so I resorted to roughly separating the butter by hand. The dough turned out to be too liquid so i simply baked it whole, then cut the triangles 10 minutes before the end of its baking time.